To re-cap Article #1 from March 5th and as required by OSHA, NFPA and the NEC: "working space around electrical enclosures or equipment shall be adequate for conducting all anticipated maintenance and operations safely, including sufficient space to ensure the safety of personnel working during emergency conditions and workers rescuing injured personnel." These requirements vary depending on whether the electrical equipment is rated at (1) 1,000 volts or less (See, Article #2) or (2) over 1,000 volts. This article reviews (2) when the electrical equipment is 1000 V or more. Minimum clearances are established for work spaces in front of high voltage - electrical equipment such as switchboards, control panels, switches, circuit breakers, switchgear and motor controllers. These distances indicate space that must be clear to the floor. - Condition 1: When there are (i) exposed live parts on only one side of the working space, (ii) grounded live parts on the other side of the working space, or (iii) when both sides of the working space are sufficiently insulated. Requires 3 - 8 ft. depending on voltage from 1001V to above 75 kV. - Condition 2: When exposed live parts are on one side of the working space and grounded parts on the other side. Concrete, brick or tile walls are considered "grounded".Requires 4 -10 ft. depending on voltage from 1001V to above 75 kV. - Condition 3: Both sides of the working space have exposed live parts. Requires 5 - 12 ft. depending on voltage from 1001 V to above 75 kV. 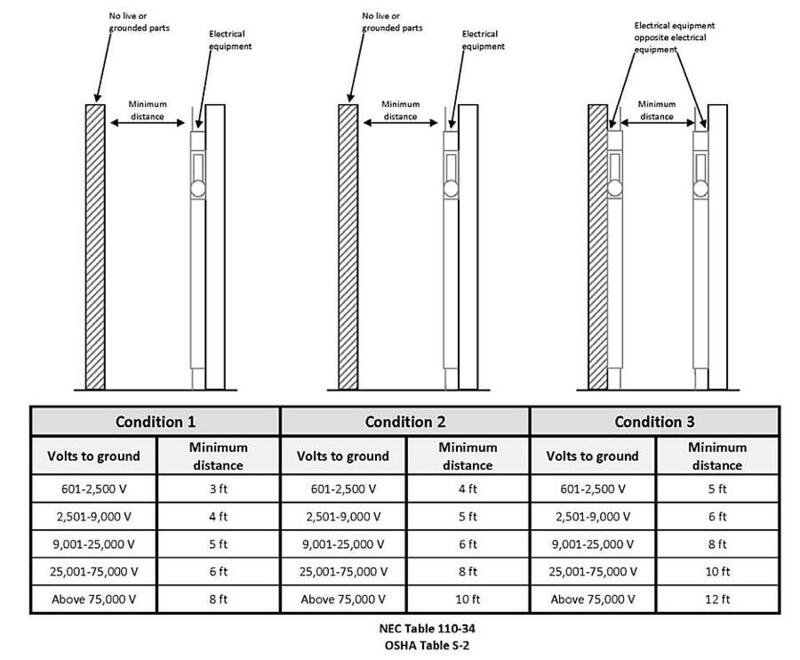 The minimum depth of clear working space for electrical equipment for each of the 3 conditions is stated in NEC Table 110.34. Correction: before 2017, the threshold divider was 600 Volts, but is now 1000 Volts. The required distances for threshold values have not changed. FREE Demonstration: Join us for lunch on April 5th (1st Friday of the month), for a free demonstration of PowerCalc: software that automatically designs the power distribution system inside a facility and simultaneously generates the 1 Line Diagram.